Two long years ago I made the switch to trail runners from my heavy waterproof leather boots. My first pair of trail runners were a pair of La Sportiva Wildcat GTX. While these are pretty awesome in spring snow, they are rather bulky, waterproof shoes. During a Presi Traverse I quickly learned that I wanted something lighter and something that was super breathable, not waterproof. Waterproof barriers are great for keeping out snow and keeping your feet warm… but not so great for hot summer days (imagine wrapping your feet in a plastic bag). La Sportiva Wildcat GTX in their element. Long story short: I eventually read about the Altra Lone Peak 2.5 . I purchased the 2.5 model for warm weather trail running and hiking. I kept my La Sportiva for the winter months. I loved the Lone Peak 2.5’s. They were super comfortable for long days and left my feet happy. However, it wasn’t all sunshine and rainbows. The durability of this shoe lacked considerably. At about the 250 mile marker my Lone Peak 2.5’s blew out at the sides near the widest point of my foot. The tread is still in decent shape with the exception of the front toe area where I did most of my steep climbing on sharp granite. I tried to tape the shoes with no avail… they tore further with every hike and the large holes allowed dirt and rocks to accumulate in the shoe. I decided to retire the 2.5’s to local trail runs and buy something new for big mountain days. Lone Peak 3.0 freshy new and ready for the trail. While I was bummed at the durability issues of the 2.5, I couldn’t migrate away from the comfort I was used to with the wide zero drop platform. This led me to the new Lone Peak 3.0! So far I only have about 30 trail miles on my pair of Altra Lone Peak 3.0’s. Here’s how it stacks up in my opinion so far. Overall, I was impressed that Altra was able to beef up the materials of the shoe without making it heavier. How do they defy physics like that?! The material is comfortable and it’s nice to have a little extra protection when you accidentally stub your toe on a rock. The upper material is a thin mesh reinforced with heavier suede like material. It feels about 100 times more durable than the Lone Peak 2.5’s which were made of all mesh. It’s a little concerning how heavy the material feels… I don’t want to give up breathability. There’s even a rubbery waterproof looking material covering the mesh toe which I probably could have done without. Here’s an important piece of information. The Lone Peak 3.0 runs SMALLER than the 2.5. I needed to move up to a 10 1/2 from my usual size 10. I probably could have gotten away with an 11 but I don’t like having a bunch of extra material in the toe box. When I remove the insole of my Size 10 LP 2.5 and compare it to the 10 1/2 3.0 they’re nearly identical. I’m wondering if they did this to save weight? In either case – size up a bit. Once I got the sizing right the shoe was extremely comfortable. A nice cush in the midsole is a plush ride when running and a nice stable platform for hiking. The heel cup is slightly narrower but for me that was a good thing. The toe box is super wide as all Altra’s are and allows some level of “toe splay”. When I paired these with my InjiInji Run socks the combination is magical. The “Stone Guard” may be a bit of marketing hype. I know it was on the older model. But these shoes do feel a lot more “protective” from sharp rocks. They’re also a bit stiffer which will probably loosen up with more miles. The new outsole design is AWESOME. I love the hexagonal lugs and added aggressiveness (is that a word?). The shoes grip incredibly well on just about anything. Steep slick wet rock? sure… Muddy roots and logs? Sure… Loose dirt and gravel? Sure! There’s not much else to say here… the traction is top of the line in my opinion. Here’s where my main concern was: How fast can these dry out after being submerged in a river? How hot will these get? Well this is still a little foggy for me. During a hike up Cannon Mountain and the Kinsmans I did accidentally dip my foot in a stream or two. Water got into the shoe and it did eventually dry out. I’d classify these shoes as “acceptably breathable”. For me it’s worth the sacrifice of the super thin mesh for a little added durability. The shoes do breathe well though. I didn’t find my feet getting super hot or clammy during my time wearing them. So far the Lone Peak 3.0’s seem like tanks. I’ve grinded the upper against some sharp granite, mud and other abrasive areas without showing any signs of damage. The sole’s also seem very robust. They still look brand new after a big hike and a few trail runs. 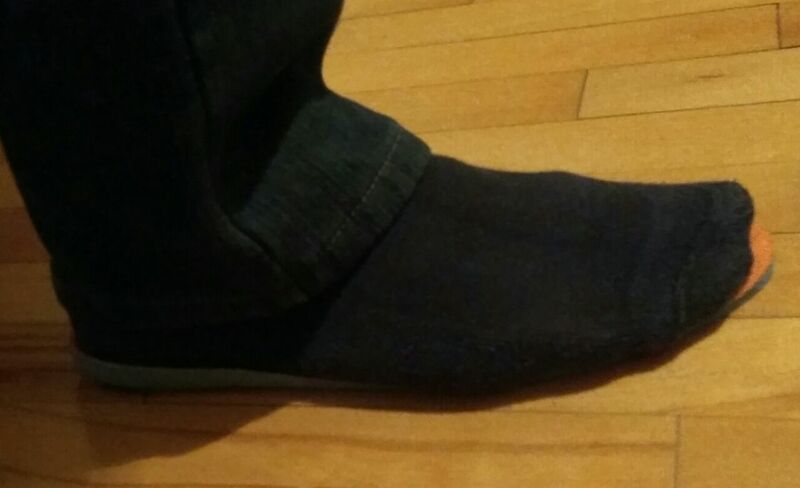 The only minor thing I’ve noticed is the rolled up toe outsole seems to be peeling away a tiny bit. I’m hoping it doesn’t affect the shoes lifespan or performance. Beauty is in the eye of the beholder right? I like the new shoe’s looks. I originally purchased the Black/Yellow variation but when I needed to size up that color was no longer available. So I went with what Altra calls “Orange”… it’s more of a red. And the “Black” in the orange is more of a deep brown. I originally didn’t care for the “Orange” color but it’s starting to grow on me. The new graphics on the side are very cool and of course the footprint on the outsole… always loved that. Here’s the Yellow and Black version I returned due to sizing. These shoes seem like real winners. If you’re contemplating upgrading to the Lone Peak 3.0’s from an earlier version of the Lone Peak – DO IT! Just keep in mind that there are some sizing variations. Buy from a reputable dealer that has a lenient return policy or go try them on at the store. I can’t wait to put in some more miles and longer days in these shoes. My hopes are high! By the way I bought these with my own hard earned dollars. No sponsorship or give away here. Buy your Altra Lone Peaks using the following link and help support this site. If I wear US12 in Asics (foot length is 29.2cm) which size should I buy in Altra Lone Peak 3? Hi Alex! I found that the lone peak 3.0 runs pretty close to true size. I personally went up a 1/2 size from my street shoe in order to have a little extra room for downhills. I’d try the 12 or 12.5! I’m not sure I can trust information from the size charts. My foot is 29.2cm and I’m wearing Asics GT-2000-4 now. Asics size chart recommends US12 for 29.5cm foot. That’s _almost_ right – US12 fits me well. A little bit tight (US12.5 would be better) but I think I haven’t worn them in yet. The insole’s length of this Asics US12 is 30.5cm and with my foot over it, it looks like this https://image.ibb.co/gSRaSw/Asics_US12_insole_2.jpg It can be seen that the longest size of the insole is not under my big toe but, rather, opposite my second toe. Do you think these could be a safe option as an approach shoe to go to climbing destinations? I wear a 15 and all the big company’s like 5.10 stoped making 15 in approach shoes. I buy 14 and get tons of blisters and it kills my huge feet. I have to have a somewhat sticky rubber bottom as lots of times your trusting your feet to the rock to friction and you can’t fall… thanks for your post. Hi Blake. These could certainly work as an approach shoe. The only concerns I’d have is that the sole is VERY flexible and the upper material is not very durable. These shoes typically last around 300 miles as trail running shoes… if you were constantly rubbing the upper on sharp edges of rock they might wear out a little quicker. That said, I’ve taken mine on plenty Class 4 scrambles and I’ve used them as an approach shoe at local crags. If your approach is fairly tame and doesn’t include any technical climbing these would work great. Great review! I also had the 2.5’s and really enjoyed them, however my feet would slide all over the place in them have they improved that aspect at all? I’m currently running in the Superior’s and love them, just ran a 25K and feet felt light and fast but could use a little more protection, eyeing up the LP 3.0’s, thanks for the review, cheers! Hey Rusty, They did tighten up the heel quite a bit. The heel feels more like the Superior than the LP 2.5. Less padding, and a tighter fit. This prevents the sloshing around while banging a fast turn. Hope this helps! Thanks for reading! Wow great review, so if i have 10″ longer foot should i buy size 10? Or 10.5? Thanks. Hey Deomark, I’d always go bigger. You’re better off having a little extra play rather than having your toes bang into the front of the shoe on descents. Hope this helps! I agree with Dave. Just bought a pair of 10’s (my usual size) and they feel slightly small (I have a pair of 2.5’s which feel great). Will have to return and try 10.5’s. Thanks, I think I’m going for it. It’s good that I stumbled upon your review, because my feet would have probably destroyed the 2.5, I almost ordered it. Can I ask how long your feet are? I’ve read that your about 5’7 tall, I’m about a same; 10 1/2 sounds very very big! Hey Máté, I think my “longer foot” is around 10.6″ long. The 10’s I ordered fit OK but I had a bit of toe bang and the forefoot felt a little too tight. The 10 1/2 fits MUCH better and are super comfortable. They’re a little longer than I hoped for but it doesn’t affect my performance too much. Hope this helps! great shoe, great review. I see you have wide feet like me (or the picture lies?). That’s why I only use Altras, for everything; but everyone says the 3.0 is way too narrow. What do you think? Compared to the 2.5? In my country there is no Altra retailer, so I have to order it, and I’m wondering, whether to buy this or the 2.5. In my current Lone Peak 2 the side of my feet “bubbles out” a bit sideways (0,2 inch), do you think that would be a problem with the 3.0, which has reinforced sides? Hi Máté, Thanks for reading the review! I’ve found that my 3.0’s are just as wide as my 2.5’s however, I did need to size up a 1/2 size. My 2.5’s are a US size 10, and my 3.0’s are a US size 10 1/2. Both shoes feel almost identical in fit despite them not being the same size. My shoe also “bubbles out” at the base of my pinky toe… Pretty sure this is what caused my 2.5’s untimely death. It’s too bad you can’t try them on first! They’re great shoes, and still holding strong! Hope this helps! Very thorough review! I have these coming in the mail and I can’t wait to try them. Thanks for helping me make the decision.